It’s been a couple of months since I last raced, a combination of disappointment and destroying my bike at the last two race attempts affecting the confidence somewhat. 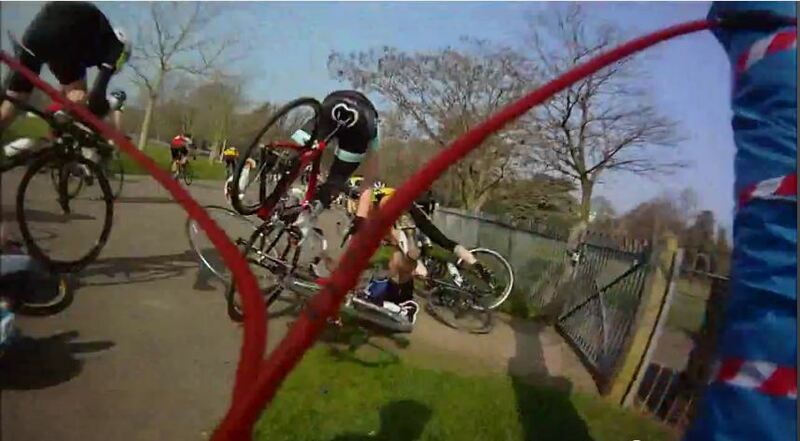 Everyone’s reaction to being told I was racing at the Leamington Victoria Park crits was ‘there’s always a crash there’ and a more inspiring ‘you’ll do alright there’. 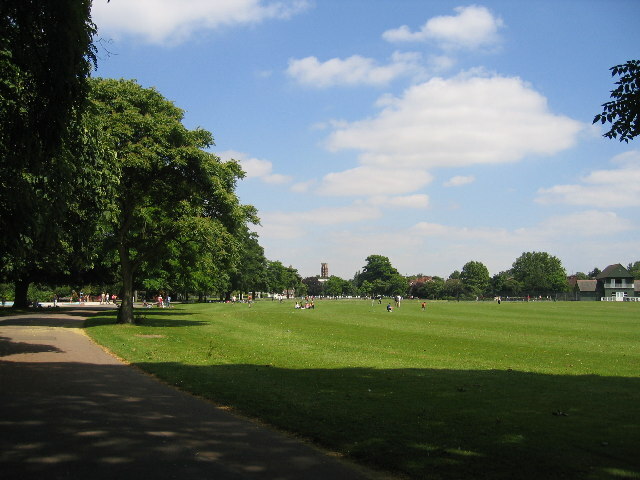 The Criterium (or Crit) is held in a park in Leamington with the circuit being a slightly wobbly oval – a first glance suggests the circuit is flat but there was a noticeable gradient on one part of the circuit but nothing particularly taxing. 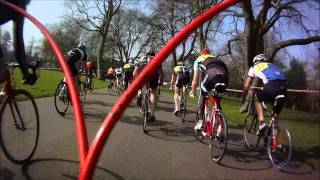 The day was split into two races of 30 minutes + 5 laps with a decent number of riders (high 40s) from a variety of clubs including some from as far away as Nottingham and Oxford. At the start of the first race and after trying to keep myself high up the field to avoid the inevitable crash when it came, I averaged around 10th wheel but after an effort to catch onto someone’s wheel as they attacked created an incident where I smacked handlebars with another rider (and luckily just about held the speed wobbles) I dropped back a touch and kept a tight inside line figuring this also meant I was doing the shortest distance. It also made it easy to move up the bunch where necessary and kept me out of trouble. 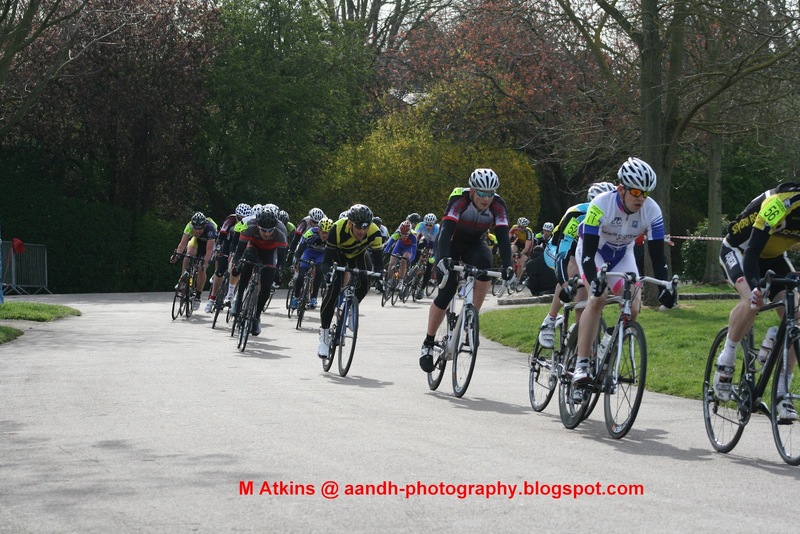 With the 5 laps to go whistle, everything suddenly became hectic as everyone went flat out and gave no quarter. There was very little room and you really had to be aware of where your lines through corners were going to take you. With 4 laps to go I found myself on the front and going past the 3 laps to go point I was still there, thinking there was no way I’d be able to keep up the power needed, I soft pedalled and dropped back down the inside, ready to move back up the outside where the room suddenly was as people took tighter lines in the corners and to hopefully be in a good position for the final sprint. After passing a few people easily on the start/finish straight, at the next corner someone overcooked it, went too wide out of the corner, took the rider behind him down too and went flying into a tree. I managed to see it and avoid it thinking to myself that I’d missed the crash for the day. Coming round the outside of the next corner I had loads of room only for the spot I’d given up a few laps before to be the source of havoc. Clubmate Tim was in about 5th wheel but got closed out on the inside of the corner and edged onto the grass at which point he went down, this then caused a domino effect that found its way across the track to where I was. This is where the brain kicked into slow motion mode and I can remember hearing the crash, seeing the riders go down on the inside, seeing the rider slide out of it into my path and then working out my attempt to go round him was going to see me crash into a metal fence. Being able to crash well is a skill and it’s a hard one to get right as not many practice it. I managed to avoid the fence and fall onto the relatively soft landing mat of a human man. A bruised elbow, bruised forearm, chainring spike marks (which looks suspiciously like bite marks) and a bit of muscle damage in the other forearm were the extent of the injuries – carbon bike, absolutely fine. I did eventually finish, riding no handed holding my helmet as a basket with sunglasses/gloves in it, but probably won’t be classified. Race 2 started with noticeably less riders taking part, some of the ten or so who had crashed obviously had decided to pack up and head home. Tim and I were fairly apprehensive at the start and were usually found milling around at the back of the bunch. I was just on autopilot maintaining contact, not really up for things as my forearm made getting out of the saddle and sprinting hurt a lot. Eventually after 20 minutes there was an attack and sprint for the prime (a mid-race sprint for the mighty sum of £10) and 9 riders went off never to be seen again. Everyone in our group let them go thinking they’d ease off and come back but it just never happened, in the smaller group I found myself with more room and feeling more secure took turns with one other rider to try and bridge the gap but it was clear we were just tiring ourselves out in a lost cause so I sat up and relaxed. We largely followed the same guy for a number of laps with a couple of bursts to push up the pace by me until again I found myself on the front too early (this seems to happen in every race…) so eased back but not as much as in Race 1. Tim was up in this group as well but everything was far too disorganised to actually work together and be useful. On the last lap of Victoria Park, I moved up a couple of places to be in 5th of our group coming out the corner where we’d crashed, I was on the wheel of someone ready for the sprint only for him to swerve across and cut me up, luckily I was far enough behind him that I could go round but 3 people in front had already started sprinting. I opened up, the legs said no very quickly but sat down I had more speed than two people on my shoulder and then I had another go at a proper sprint to catch the two riders well ahead. I closed the gap but didn’t quite have enough to overtake both and ended up 2nd by half a wheel in our bunch and 11th Overall. The highest place you can finish with no recognition (the same as 4th at the Olympics). 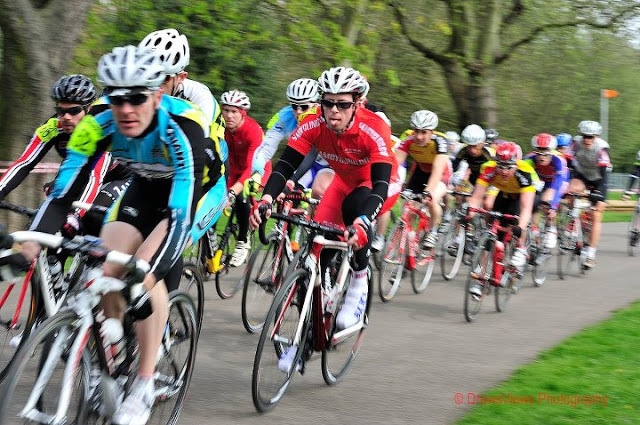 Two very contrasting races at Victoria Park, both good for the experience in a way, my first race crash and also my first actual sprint for the line, which also showed I have one. Physically it seems I’ve got the legs to be there at the end, tactically I could use some work to give myself a better chance at getting a higher result. At the moment, I’m knocking on the door of a very good result. Have you got a link for the pics taken on the day? I haven’t unfortunately, there seems to be far more about for previous years rather than this year. I was hoping Kenilworth Wheelers would put something up as it was their race but it doesn’t look like it. See you did well in the first race, did you take part in the second one too?